Thank you so much Diana for the very helpful step by step process on encaustic art. I love the projects that you demonstrated and really feel that you have demystified encaustic art. I can't wait to do it now. Many thanks. Diana is an award winning artist. She earned her Masters of Fine Arts (MFA) graduate degree in Studio Art from the Maryland Institute College of Art. As an art instructor for more than 20 years she has helped and guided hundreds of individuals to discover their creative selves. After graduating with her BA degree in art she worked as a commercial artist at various companies for a few years. She then earned her Masters in Education ( M.Ed.) in art education from the Tyler School of Art. Since then, she's been employed as both an art instructor and professional fine artist for more than 20 years. Her artwork is represented in private and public collections in the U.S., Europe, and the U.K. This class is meant for anyone who has ever wondered about encaustic painting but not tried it yet........or even for those who have. You will learn a lot about this ancient art form with a modern twist......by the addition of digital photos. I think you will find it fascinating to combine the ancient with the contemporary. In 2003 is when I first started exploring this unique medium. Soon I was hooked ! My explorations included painting with encaustic pigments by itself, with oil paint, and with digital photos and collages. In 2004 my ENTIRE solo exhibit for my Masters in Fine Arts degree was dedicated totally to encaustic painting on digital self portrait photos in very large scale. .......4x5 feet for each self portrait. Read on further about what you will learn ! And MUCH more as listed below.....Keep Reading ! 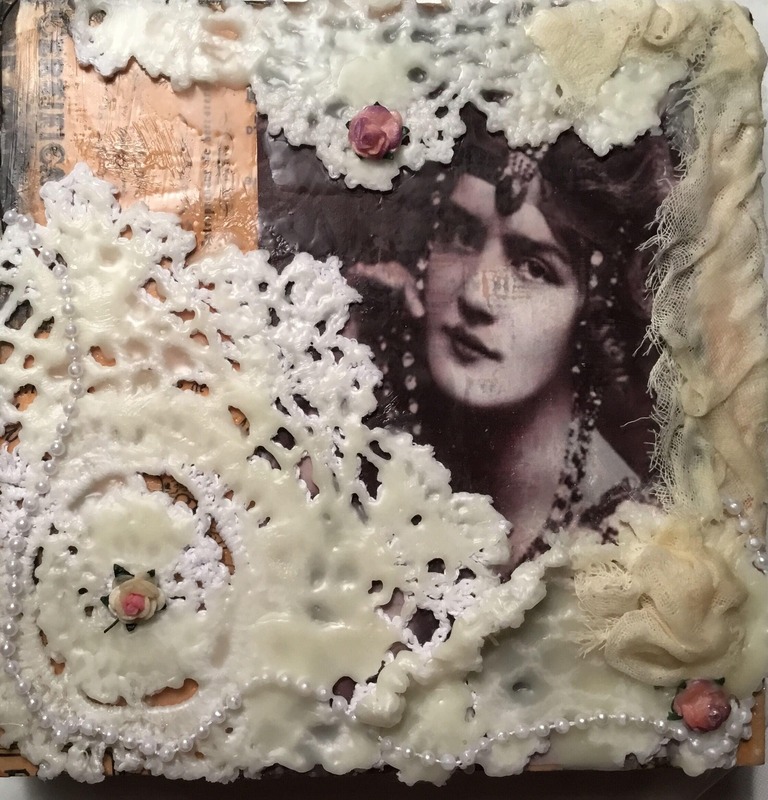 In this first project, you will create a mixed media & encaustic portrait using digital imagery of your choice from the available class resources from Pinterest or your own imagery. I’ll show you how to incorporate the digital imagery with layers of wax for fabulous results ! 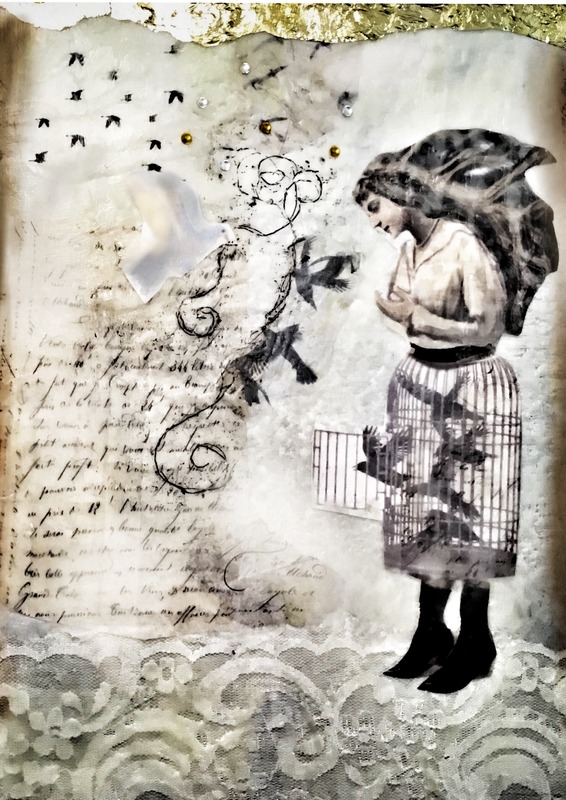 For this piece, you will use imagery to create a whimsical vintage Theme . 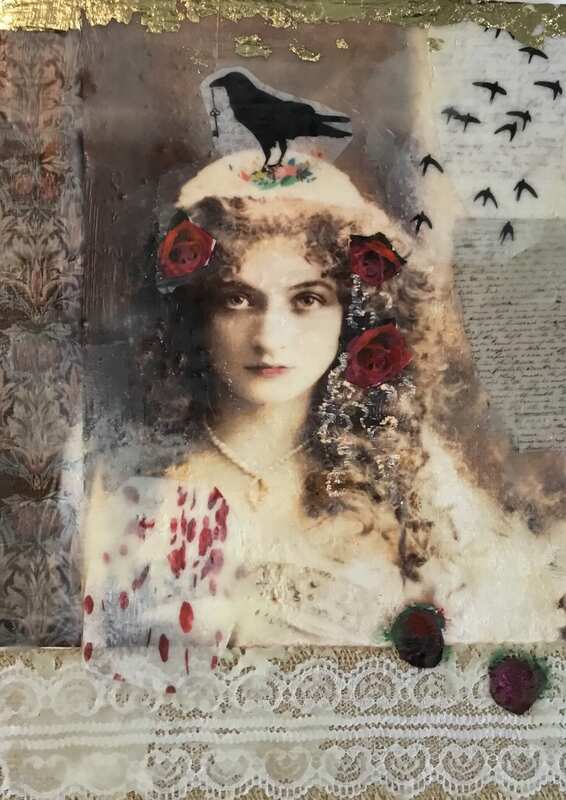 You will use oil paint, oil pastels, gold leaf, lace, and more…..in combination with photo and copyright free imagery , creating a unique work of art ! In this project you will experiment with the materials and textures. Try using different papers and/ or fabrics and layering lots of wax. And try abstraction with a pop of realism as you will learn in this project. Purchase for yourself or a friend ! Here's a sneak peek of the class ! Take your time with the videos - set your own pace. Connect with me and other students on our private Facebook page and have access to awesome image resources. Here's a short video to give you an idea of the basic encaustic set up.A more detailed video will be included in the class. Please use what you have and don’t feel obligated to get all these supplies !